Thanks so very much for organizing our trip to Europe, It was perfect in every way. The accommodations were amazing and centrally located which made it easier for us to enjoy the sights. Your recommendations for sightseeing and touring different areas were great. We especially enjoyed the apartment in Split which was within the Diocletian Palace and also the five star Ariston Hotel in Dubrovnik. Thanks again for making our European travel and experience so wonderful. We look forward to booking our future holidays with you. Mike is a 33 year veteran of the travel industry, and brings a vast amount of experience and diverse knowledge to the company as he guides it through the ever changing phases of the marketplace. Mike creates costomized tours Worldwide, especially Destinations Weddings in the Caribbean, Mexico and India. Luxury packages that will make your Dream Holiday a reality. With flawless execution and precise attention to detail, your trip will be a joy to recall and share with your friends and family. Contact Mike and ask him to create those romantic and memorable moments of your life. Suzanne has been working in the travel industry for over 30 years. She had travelled extensively to Europe, Bali, Malaysia, Hawaii & theCaribbean, Mediterranean and specializes in Caribbean & Mexican Travel. Finance and accounting is looked after by Sonal Kendall, her diligence ensures the smooth operation and accurate accounting of receipts and payments to the proper recipients. 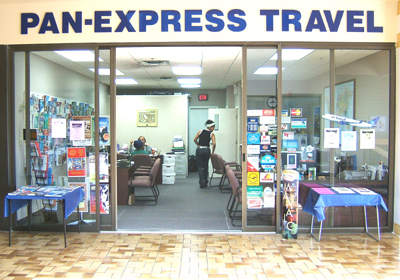 Her enthusiasm and dedication to customer care will ensure all your travel and holiday needs are well taken care of..
Today Pan-Express Travel Ltd. offers a wide range of products and services including special airfares, package holidays, cruise packages, hotels, car rentals, insurance and specialty tours, including last minute sizzling specials.